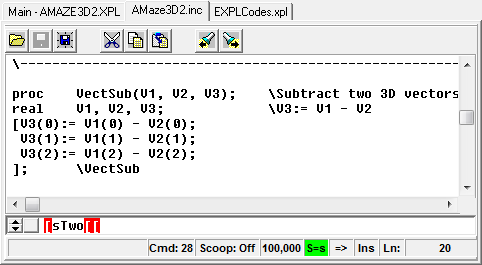 The EXPL IDE can open and display multiple XPL source files in separate editors. Each editor will have its own page that can be selected by clicking on the corresponding tab. The editors are based on the Xedit programmer's editor and use a subset of the Xedit commands and features. There are two basic kinds of editors in EXPL: one Main Editor and one or more Auxiliary Editors. The Main Editor. EXPL always has one Main Editor. This editor always holds the main source file. The main file is the file on which an XPL program is based. It is always compiled first before any other axillary or include files are processed. The Main Editor is always labeled with the designation "Main." There is always a Main Tab, and it cannot be removed. The EXPL compiler reads directly from the Main Editor's buffer, so the main XPL file doesn't need to be saved to be compiled and executed. This means that you can enter and test XPL code without committing the code to disk. Auxiliary/Include Editors. Any files that are not in the main file are opened on separate pages. You can have an unlimited number of these files open at one time. They are often additional XPL files that are "included" by the main file. They can also be other XPL files that are not part of the main file. This is useful for copying code snippets to the main file. They can also be any unrelated text file. Unlike the Main Editor, the EXPL compiler does not read directly from these editors. As a result, changes to any include files in an auxiliary editor must be saved before the compiler will use them.